The origins of FLI go back to the period of the German Democratic Republic (GDR). The “Central Institute for Microbiology and Experimental Therapy – ZIMET” on the Beutenberg Campus in Jena was one of the largest biomedical non-university research institutions of the GDR in the mid-1980s. Its research focused on antimicrobial compounds. In 1991, two research institutes emerged from the ZIMET: the Hans Knöll Institute for Natural Product Research (HKI) and the Institute for Molecular Biotechnology (IMB), which was accepted to the “Blue List” (since 1997 the "Leibniz Association"). The focus of the IMB centered on basic and translational research in the area of molecular biotechnology with particular emphasis on diagnosis and therapy of human diseases. IMB’s contribution to the worldwide Human Genome Project – by participating in the sequencing of chromosomes 8, 21 and X – made the institute well known domestically and internationally. With Professor Peter Herrlich as Scientific Director, the institute developed a new research mission, which focused on the mechanisms of aging and age-related disease. In 2005, the IMB was renamed to the Leibniz Institute for Age Research – Fritz Lipmann Institute (FLI) and thereby became the first national research institute in Germany dedicated to broad biomedical research on aging. 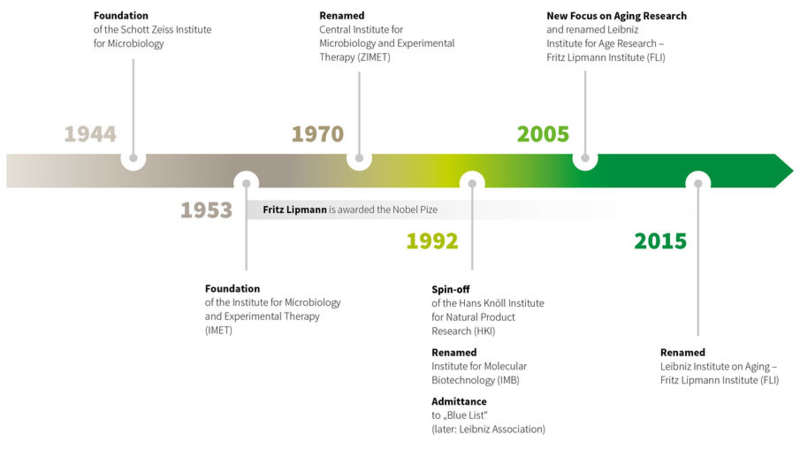 In October 2015, the institute’s name was adapted to its research focus even more precisely: Leibniz Institute on Aging – Fritz Lipmann Institute (FLI). From 2012 to 2017, internationally renowned stem cell expert Professor Karl Lenhard Rudolph has been Scientific Director of the Institute, adding stem cell aging, genome integrity and systems biology to FLI’s research focus. Professor Alfred Nordheim has been Scientific Director since March 2018. The Leibniz Institute on Aging’s name commemorates Fritz Lipmann, an outstanding German-American biochemist who contributed substantially to our understanding of the foundation of aging. Fritz Lipmann was born June 12, 1899, into a Jewish family in Koenigsberg, East Prussia (now Kaliningrad). He initially studied medicine and later chemistry and pharmacology in Königsberg, Munich, and Berlin. He conducted research in Copenhagen after 1930, then in Boston and New York beginning in 1949. A considerable part of Lipmann’s work involved the metabolism of energy compounds in cells. He recognized that the ATP molecule (adenosine triphosphate) functions as the main transporter and source of energy in the cell and that coenzyme A was an important intermediary in fat metabolism. 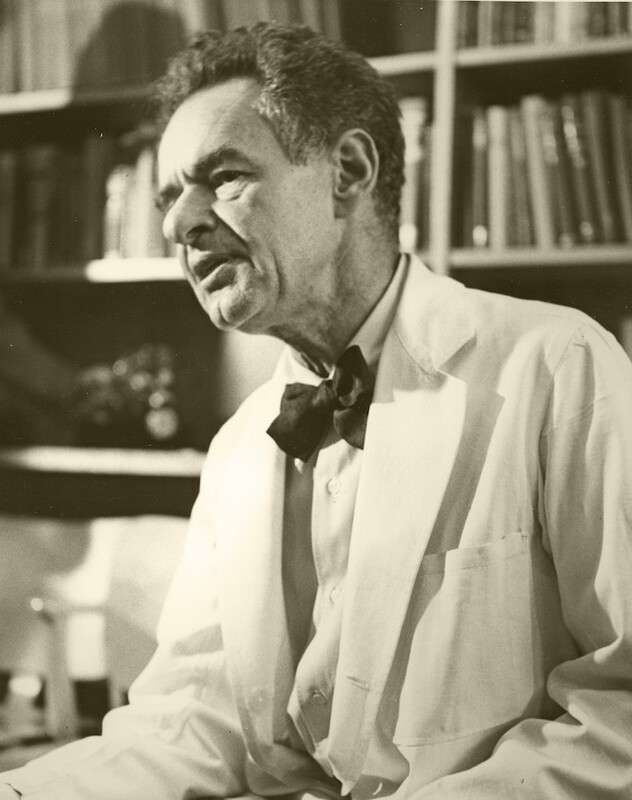 Fritz Lipmann was awarded the Nobel Prize for Physiology or Medicine together with the German biochemist Hans Krebs in 1953. His insight into the relationship between metabolism, life expectancy and the reduction in energy production by mitochondria in aging organs laid the fundamental principals for cell-based research on aging.